uuid : 93a9c1a9-dbe7-42b7-9ea5-8ccb0fade908 templates_id: 119512 templates_uuid: "18d9d3c2-5457-456a-baf3-c1ee87977128" title: "Term sheet - Term sheet template - Term sheets" display_name: "Term Sheet" meta_keywords: "Investor agreement and Termsheet" description: "
Outline the key financial terms and other terms of a proposed investment using this term sheet. Investors use a term sheet as a basis for drafting the investment documents. With the exception of certain clauses, commonly those dealing with confidentiality, exclusivity and sometimes costs, the term sheet is not intended to be legally binding. It is crucial that the founders of a company understand what they\'re signing up to beyond just the valuation and investment amount, as they will have to live with these terms and in certain cases, convince their fellow shareholders to accept them also. A term sheet is a document that sets out the terms under which an investor will invest in a business - typically a startup company. It outlines the main terms and conditions of the investment deal, and guides the preparation of the final agreement. Why do I need a term sheet? A term sheet lays the groundworks for a negotiation, and ensures that the parties involved in the transaction agree on the most important aspects of the deal. By setting out the terms of the future agreement, the term sheet reduces the likelihood of disputes further down the line. A seed investment is an early stage investment, that usually funds the first operations of a business, such as research and development. It\'s the invested capital that supports the business until it can generate cash, or until it is ready for further investment. \r\nSeed investment is quite high risk, so this type of funding is often compensated with the investor obtaining equity stake in the business. The lead investor is the investor that contributes to the most significant portion of the investment. They play an important part in the development of a business, for it is usually they who sign the term sheet and engage in the seed investment. Lead investors can be family members or friends of the business founder, high net individuals (ie angel investors) or venture capital investors. Which factors should investors take into account before investing? Information about the business, eg business plan, management team, market position, competition. The level of control they\'ll have over the business and over the investment itself. The way they can get their money back in the event the company is sold or closes down. 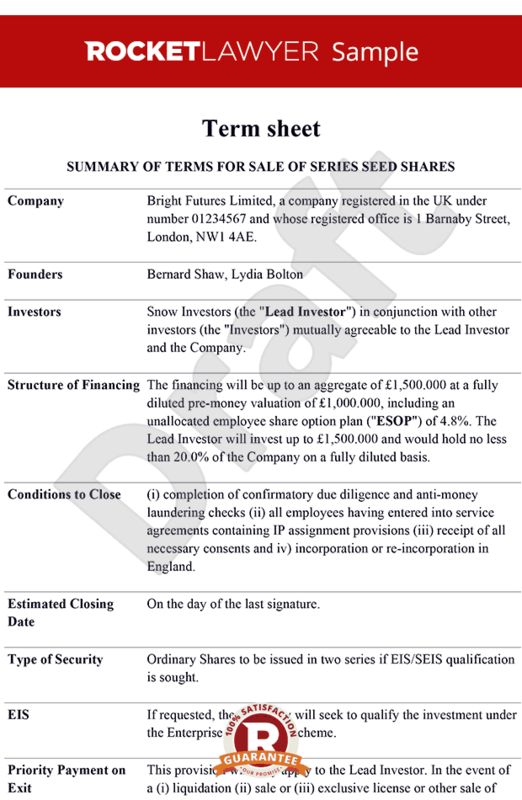 This term sheet is governed by the law of England and Wales. \r\n" created_timestamp: "2018-10-08 04:36:32.0" modified_timestamp: "2018-10-08 04:36:32.0" active: true created_by: 104 modified_by: 104 dcm_id: 348 url_slug: "Term-Sheet" meta_description: "Term sheets outline how an investor will finance a start-up company. Negotiate investment using this term sheet template which sets out key terms." time_to_complete: "15 minutes" role1: "Investor" role2: "Investee"
Outline the key financial terms and other terms of a proposed investment using this term sheet. Investors use a term sheet as a basis for drafting the investment documents. With the exception of certain clauses, commonly those dealing with confidentiality, exclusivity and sometimes costs, the term sheet is not intended to be legally binding. It is crucial that the founders of a company understand what they're signing up to beyond just the valuation and investment amount, as they will have to live with these terms and in certain cases, convince their fellow shareholders to accept them also. A seed investment is an early stage investment, that usually funds the first operations of a business, such as research and development. It's the invested capital that supports the business until it can generate cash, or until it is ready for further investment. Seed investment is quite high risk, so this type of funding is often compensated with the investor obtaining equity stake in the business. The level of control they'll have over the business and over the investment itself. More than just a Term Sheet template, our step-by-step interview and guidance makes it easy to create your document. Easily create online, download, print and sign your free Term Sheet in minutes. This document is also sometimes called: Investor agreement and Termsheet.